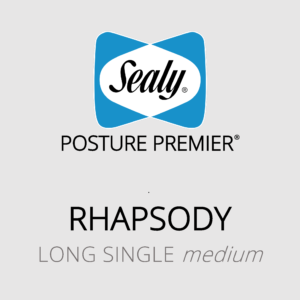 The Sealy Posture Premier (Rhapsody) long single mattress with medium feel is the best combination of comfort, support and value. Featuring Premium Foam, PostureTech ST springs and EdgeGuard® Edge Support. The Sealy Posture Premier (Rhapsody) double mattress with medium feel is the best combination of comfort, support and value. Featuring Premium Foam, PostureTech ST springs and EdgeGuard® Edge Support. The Sealy Posture Premier (Rhapsody) king mattress with medium feel is the best combination of comfort, support and value. Featuring Premium Foam, PostureTech ST springs and EdgeGuard® Edge Support.